MIAMI, Sept. 24, 2012—Miami Tower, an iconic symbol of the city, makes a dramatic new statement in the downtown skyline with the recent adoption of a state-of-the-art exterior LED lighting system. The advanced LED system will reduce related lighting energy usage by 92 percent, save tenants and the building’s owner nearly $260,000 per year in energy and related operating costs, and reduce CO2 emissions by more than 1.2 million pounds. 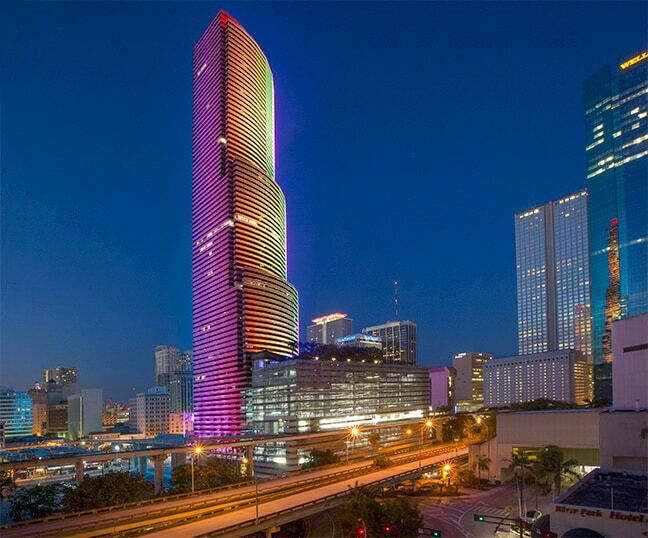 The cutting-edge LED lighting will also allow custom light shows at the push of a button in support of tenants, holidays, civic and charitable groups, and other organizations looking to promote or commemorate special events, further cementing the building’s status as an icon on the Miami skyline. 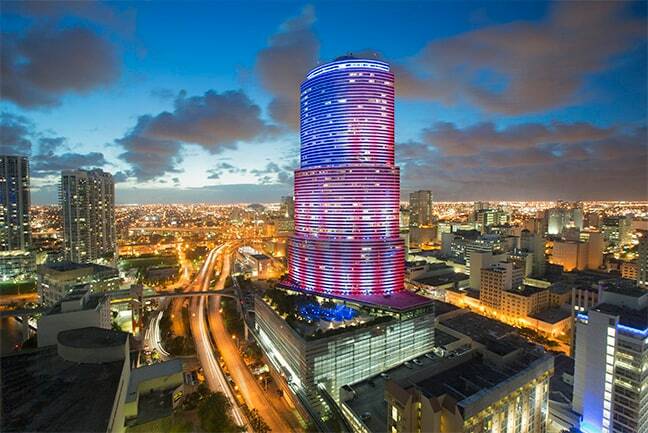 Miami Tower rises 47 stories and offers 623,000 square feet of commercial space. The team of Jones Lang LaSalle, Philips Color Kinetics and LED Source identified the optimal LED lighting solution based on long-term operational savings and the fact that it reflected the commitment to advanced technology by LaSalle Investment Management, the building’s owner. The installation team replaced 382 metal halide lights that consumed 1,000 watts each and were limited to only a few static colors, with 216 ultra-modern LED fixtures able to produce 16 million colors and hundreds of dynamic lighting effects. The system is managed by a software application that allows operators to change the tower lighting at a keystroke and virtually in real-time. 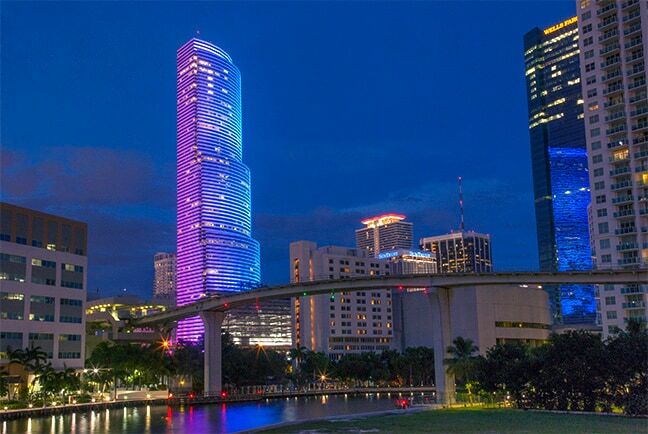 The exterior lighting retrofit is the most prominent element of a broader initiative to reduce energy and water usage and to follow sustainable management practices at Miami Tower. Jones Lang LaSalle (NYSE:JLL) is a financial and professional services firm specializing in real estate. The firm offers integrated services delivered by expert teams worldwide to clients seeking increased value by owning, occupying or investing in real estate. With 2011 global revenue of $3.6 billion, Jones Lang LaSalle serves clients in 70 countries from more than 1,000 locations worldwide, including 200 corporate offices. The firm is an industry leader in property and corporate facility management services, with a portfolio of approximately 2.1 billion square feet worldwide. LaSalle Investment Management, the company’s investment management business, is one of the world’s largest and most diverse in real estate with $47 billion of assets under management. For further information, please visit www.joneslanglasalle.com. Founded in August 2005 by Marcel Fairbairn, LED Source® is an international LED lighting solutions provider that specializes in design, support, development, project management and financing, through its Retrofit, Architectural and Entertainment divisions. The company launched a franchise program in October 2009 and has expanded to 12 locations throughout the U.S. and Canada. LED Source expects to have a network of 150 franchise offices throughout North America within three years. For more information, please visit www.LEDsource.com.